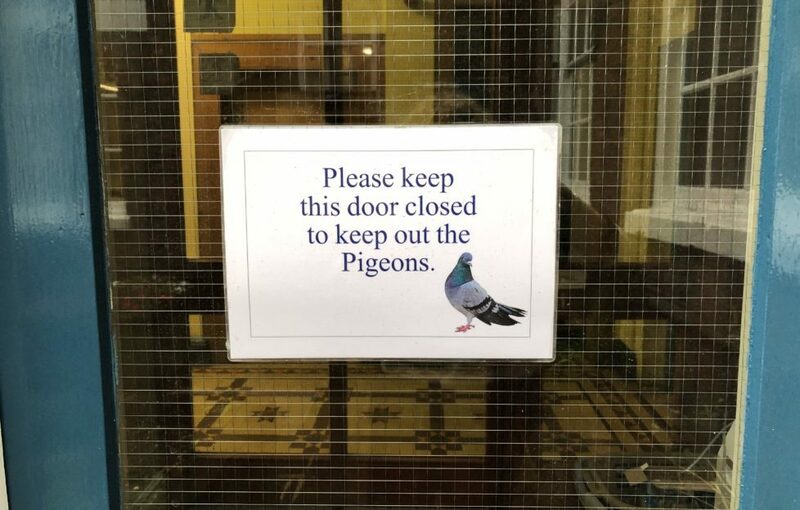 Please keep this door closed to keep out the Pigeons. It’s the capital P for Pigeon that tickled me. The sign was on a door of a courtyard garden at the Bar Convent in York where we held this week’s writing workshop. I’ll write more about that shortly. But meanwhile, back to the Pigeons. I like the wee image on the sign, too. Pigeons have that proud, puffed-up strut, don’t they? And this chap sure looks like a Pigeon with Attitude. I can just imagine him kicking the door open, bustling his way in, and demanding crumbs. I see it as a story starter though, because we all know someone like that. Self-important. Striding in where they’re not welcome. Not taking a hint. Having to be shut out. And sometimes these people aren’t aware of it. They haven’t noticed people disappearing. Or suddenly finding other things to do. They’re two different aspects, and suggest multiple types of story. Strident. Perhaps humorous. Perhaps sinister – with our cosy edge, please! Perhaps it’s a poignant piece, the unwanted outsider vulnerable and alone. I’m referring to Pigeon as him. Maybe he’s a her. And actually – note that Pigeons is plural. How many marauding Pigeons are we talking here? And what are they after? Our local shopping centre got new doors earlier this year, and although they’re automatic, they probably stay open longer than they used to. Long enough for our local pigeons to stroll in, anyway. You’d see them waddling about inside, peering out through the glass walls at their mates. It obviously became a problem for a spell – maybe it was just one particular Pigeon. The ringleader. But they actually had security guards on the door to keep them out.